So in this video we are going to talk about Geothermal Therapy. Geo, being stone and thermal, being temperature and therapy obviously is whatever modality you choose to add to it. The geothermal therapy is a nice way of applying temperature to the body without the mess of all the different options we have out there with hydroculators, Vichy showers, hydrotherapy tubs and that way, cryotherapy with the ice that melts all over the place. So we can, with a stone, because the constitution of the stone doesn’t have to change, the stone doesn’t change its matrix or anything when you heat it or chill it. It stays the same. So with the stone we have the option of bringing that temperature to the body in a more neat, clean way, and more economical because it’s small and it’s portable. 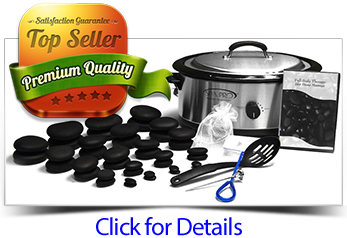 It’s a lot cheaper to buy a set of hot and cold stones than it is to buy a hydrotherapy table. So with the stones we’re going to be able to either chill them or heat them. We’re going to want to chill if we want to reduce inflammation and congestion or any kind of blockage in the body. When we want constitutional change, when we want a chemical reaction within the internal system and the tissue, the muscle and the fascia, then we need to use the cold stones and apply that cold accordingly to what that client needs. How you’re incorporating it with that modality, be that shiatsu, Swedish massage, Lomi Lomi or energy work. Then you can use your stone to heat it and bring in that sedation, that relaxation and that softening of the muscle. So your cold is always going to be the healing aspect of your treatment with the Geothermal therapy because it challenges the body to chemically change its constitution and the heated stones are going to sedate and relax. You can’t use enough hot stone on a body to change a constitution within the internal system. You only get a change within an isolated area. If you did the hot stones enough on the body to do that you would cause harm by burning. We can change the constitution in the body’s lymph, blood and digestive system with a cold stone and not cause harm. So, for the client’s benefit, you can help facilitate healing through cold application and keep them warm and sedated with the heated application and bring about a change within whatever is going on with their system. Whether it’s internal systems that you want to change or whether it’s the muscle or a group of muscles that need to be changed. For the therapist, the stone offers you an extension of your hand. It’s going to support your hand. Whatever modality you are using you want to use that stone is such a way that your hand is completely supported, your thumbs are supported, your fingers are supported, and your wrist is supported. So at all times that stone becomes an extension of you. Allowing you to have a firmer mechanism going in to the muscles, into the client’s body. Your fingers are not doing the work and your thumbs are not doing the work. And also, whatever temperature you are using, just like it changes the constitution of the client’s body, it changes yours because while you’re holding that cold stone it’s going to reduce inflammation in your hand, in your thumb, in those wrists that are tired from all that deep tissue work. It’s going to offer you that healing process as well. So the whole time you’re holding that cold stone you’re helping your own body to heal. You’re asking your own body to chemically change. When you’re holding that hot stone it’s going to help sedate your hand, but that cold stone is where you’re going to get the healing benefits while you’re offering the healing benefit to your client. So it’s important to be able to embrace the power of what that cold is doing for you with that stone, and take advantage of that. Not only for yourself but for your client’s benefit as well.